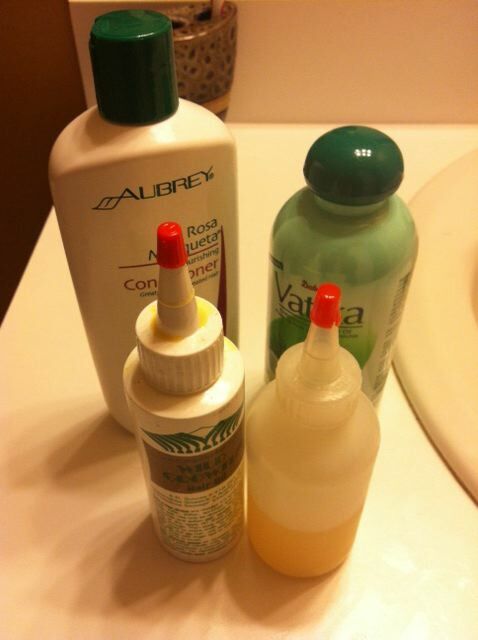 On Sunday, I pre-pooed with a new Aubrey conditioner that I ordered from Vitacost a couple of weeks ago. Now you know that I love the Honeysuckle Rose (HSR) and GPB conditioners, but I’d heard good things about the Rose Mosqueta and wanted to give it a try. 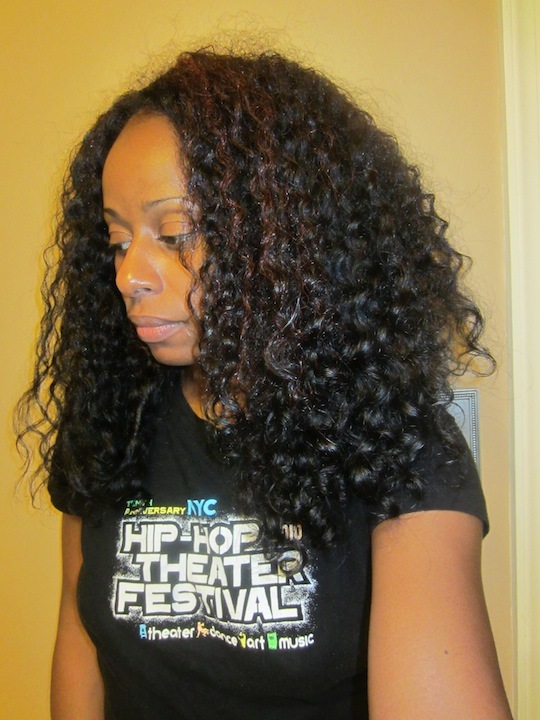 I followed my normal process of mixing the conditioner with Vatika oil and then applied it while lightly finger detangling and placing my hair in 6 twists. I then applied Wild Growth Hair Oil to my scalp (I really owe you guys a review on the WGHOs, don’t I??) and donned a plastic cap and my thermal heat wrap for a couple of hours. Eventually I went to bed without washing my hair and, on Monday morning, just didn’t have time to wash it. 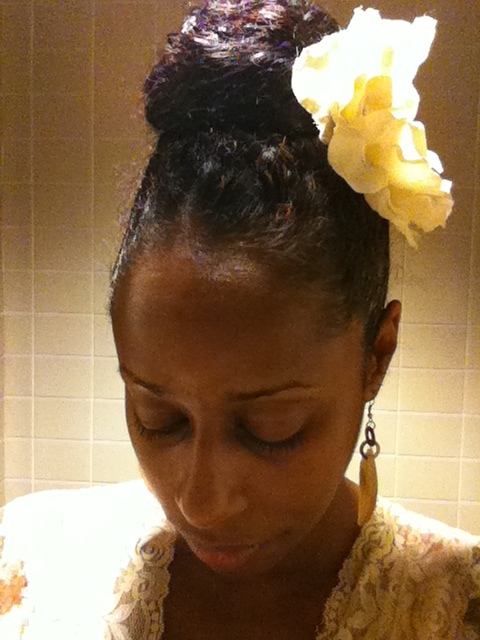 So, I whipped out the trusty banana clip for my “go to” big bun. Added a big ol’ hair flower for good measure ;). Yeah … didn’t wash it Monday night either … but my scalp was itching slightly, so knew that I had to shampoo on Tuesday morning. 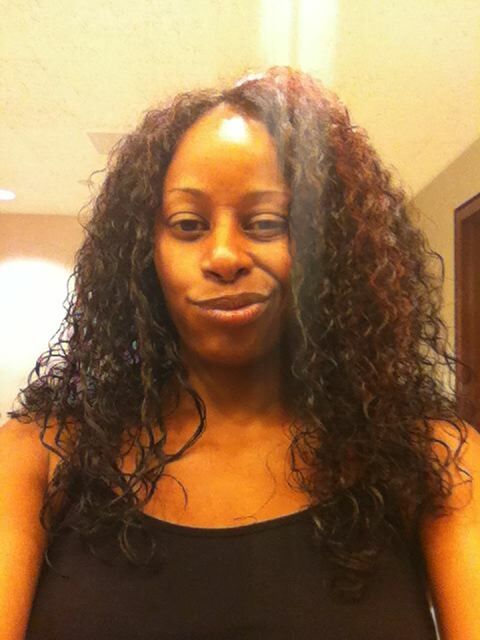 I placed my hair back in 6 twists, then washed with diluted DevaCare No Poo. Next, I applied HE HH to finger detangle under the shower stream (which was pretty easy, breezy, lemon squeezey). I re-twisted each section after detangling and rinsed under cold water. Hopped out of the shower and used my Curl Cloth to pseudo-plop my twists while I washed my face, brushed my teeth and lotioned up (was following some of CurlyNikki’s “Fluffy Definition WnG” steps with a few modifications). My hair was only slightly damp and then I tried a new WnG combo: Aubrey Honeysuckle Rose Conditioner (moisturizing leave-in) + LaBella Lots of Curls Gel (hold). I was a little nervous about how it would work out as I usually apply products to wet or soaking wet hair when I’m doing a WnG. Morning: After product applied and still damp. Early Afternoon: Fully dry, stringy, crunchy and untouched. Fluffy, full and soft after scrunching out the crunch with Wonder Curl Polishing Pomade. What a difference a scrunch makes, right?!?! It’s amazing to me how one little step can make my hair go from, “Ewwwwww … pathetic. Where’s that scrunchie?” to “LOVE it! !” I wonder how many give up on a style because of impatience or not knowing that one little step or trick that will take a style from #FAIL to #FAB?? Anywho, this is it in the evening after getting home around 9 pm. So, I’m pretty pleased!! Looks like my curls are back one wash post-cassia, as I anticipated (whew!!). Shoot, even that straighter nape area is behaving and curling up to meet the shorter layers!! And, even though I didn’t deep conditioner post-shampoo, my hair feels very soft and light. The Aubrey Rose Mosqueta Conditioner was comparable to the HSR and I don’t know that I appreciated much of a difference between the two. If there was one thing, my hair did seem easier to detangle than normal. However, I’m not sure if that’s attributable to the conditioner or the 30+ hour pre-poo!! I’ll have to see if I notice the same ease of detangling the next time I use it with a typical overnight pre-poo. Though my hair doesn’t feel super-moisturized, it’s also not dry. It feels lightly moisturized, so I will probably apply a little something to it in another day or two. And, guess we’ll see what else evolution has in store for this WnG over the rest of the week. Only time will tell!! How does your WnG evolve on Day 1? Day one for me is similar. After the leave-in and defining lotion it looks like I have either a jerri curl or it’s loaded with gel…and it gets hard/crunchy. Once it is fully dry I flip my head with some type of shine enhancing product and scrunch it. It turns into a full had of fluffy and defined curls. Aubrey products are next in my list. Heather, are you still loving your cut:)? 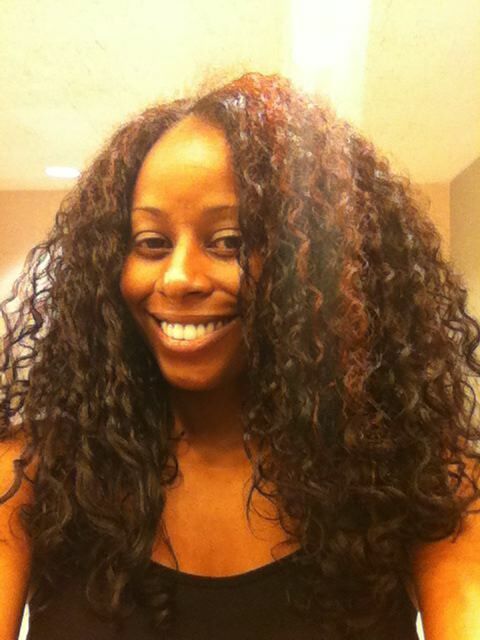 Are you like Tiffany, rocking awesome WnG hair every day now??? Tiffany’s hair just got better and better after the cut! What about yours? First, your hair never looks pathetic. It may not be to your liking or what you’re used to but pathetic is over kill. LOL!! Michelle, it looks sad to me in that first pic, but thanks;). Yeah, I’m going into winter styling mode too. This probably isn’t the absolute last WnG of the season, but won’t be many more. 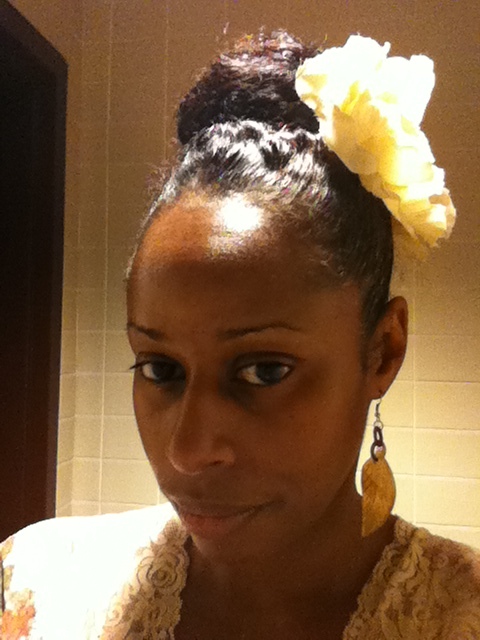 I really do love styles that keep my hair up, out of the way and stretched so that it doesn’t tangle too much. Love it! I have the exact opposite problem that you do. My WNGs usually result in very large, puffy hair with lots of shrinkage that I really don’t feel comfortable rocking in an office. 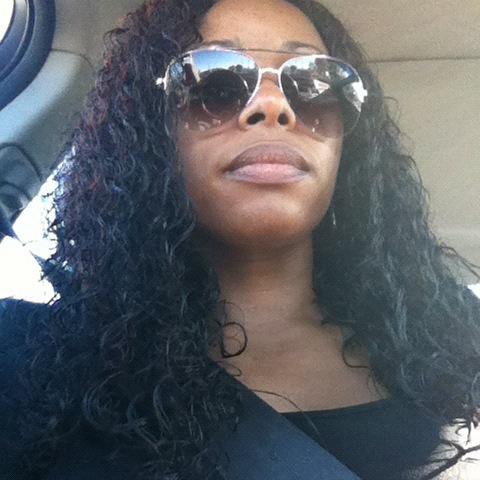 My WNG struggle has been to find something that gives definition and at least some hang time. Maybe that’s just not possible, but I’m def. open to suggestions if anyone has ’em! Keneisha, have you tried KCKT? 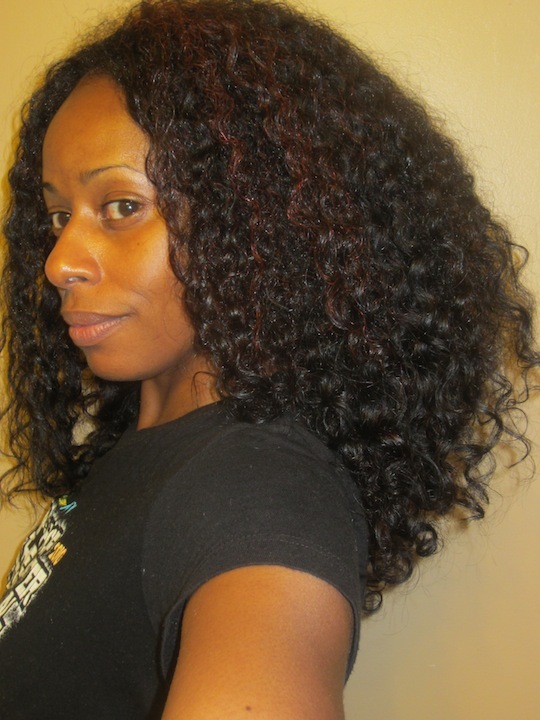 If you want hang time and you have a lot of shrinkage, WnGs just may not work for you and twists and braid-outs are probably the route to go. Soooooooooooooooooo pretty! 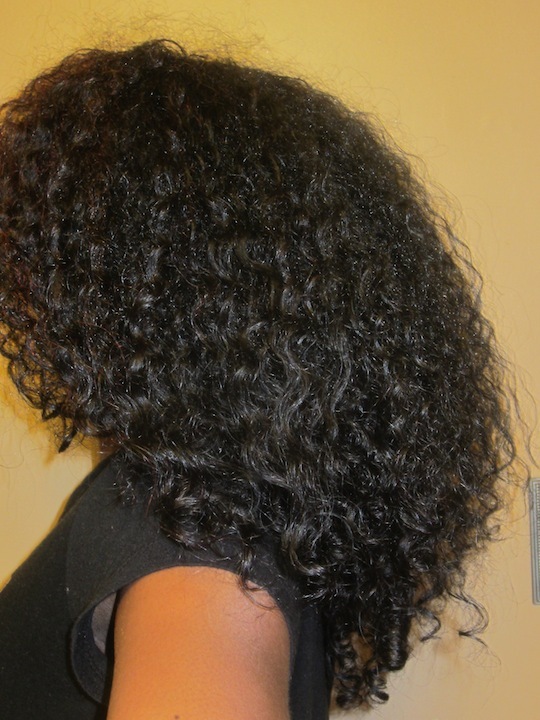 If my wash and goes could turn out like this …. wow! Actually, I’ve never even tried one (I’m transitioning, last relaxer was Feb. 2011) – I’m too scared to do ANYTHING with my hair except for a bun! I’ve done 1 or 2 bradouts, but that’s it! Scared of my own hair, SMH. 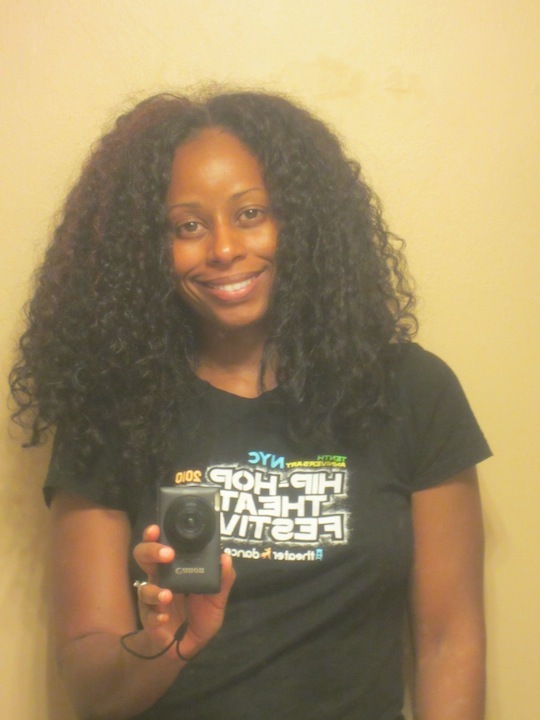 I’ve been loving Deva care new styling creme for wash and Go’s and twist outs. Its like no other product I have used. You use it on damp hair and it leaves your hair soft and defined after it drys. No scunching, its amazing. Unfortunately it is pricey especially for 5.1 oz. 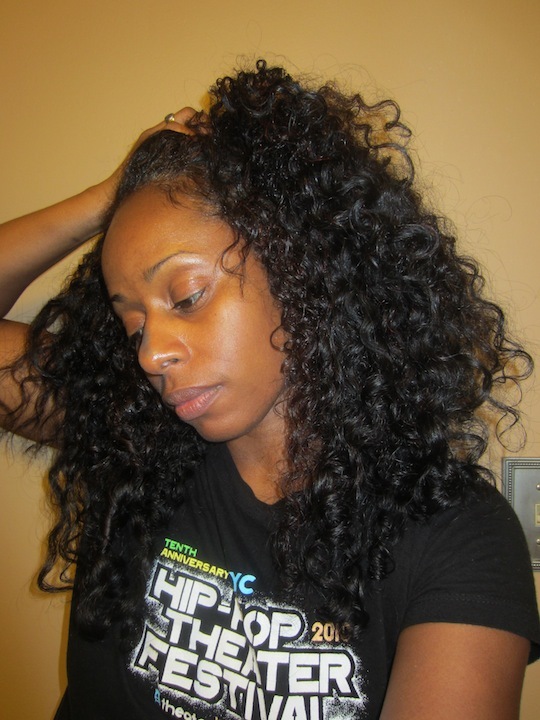 Oops I meant deva curl styling creme. You tuber rachaelcpr has a good review on the product. Ugh. You have the most gorgeous hair. Okay, I’ve fought and fought my PJ tendencies, but now that I’m searching for a new conditioner, the Aubrey Organics line is sounding really good to me. I have a question though. I notice that you like the GPB and was wondering how the protein affects moisture. I was thinking about trying it but saw the protein part and my thirsty hair was like, “no, girl–don’t do it.” I was just wondering: do you find that the GPB has enough moisturizing properties so that the protein isn’t an issue? I may just stick with the Honeysuckle Rose, but was wondering about GPB. Shoot, I may buy both! Stephanie, I use it as a pre-poo mixed with Vatika oil and generally DC afterwards, so it has worked fine for me.